Looking for the best way to prepare for your psychometric test? Well, look no further. Our sample psychometric tests are designed to give you an idea of the questions you are likely to encounter, regardless of the test you need to take. Easily pass your psychometric tests by signing up for our full preparation experience today. Get an idea of what to expect during your psychometric tests by using our free test resources. Once completed, each of our free psychometric tests produces a score report enabling you to review your results with included answer explanations. Sign up today to access full-length practice tests, study guides and more to ensure your success during your upcoming psychometric tests. There are dozens of types of psychometric tests used by employers and universities. 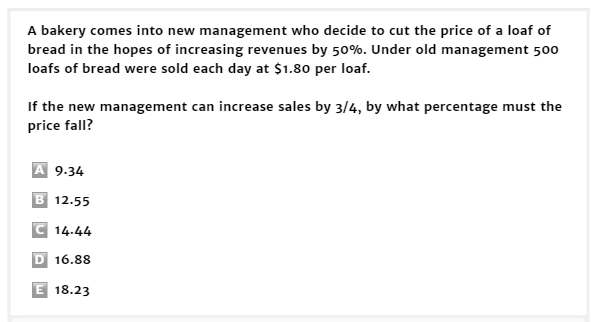 Below you will find several sample questions from some of the most popular types of these tests. The next step is to calculate the new sales and hence the new price, given the increase of three quarters. The logic: The inner shape in one frame becomes the middle shape in the next frame; the middle shape becomes the outer shape in the next frame; and the outer shape becomes the inner shape two frames later. 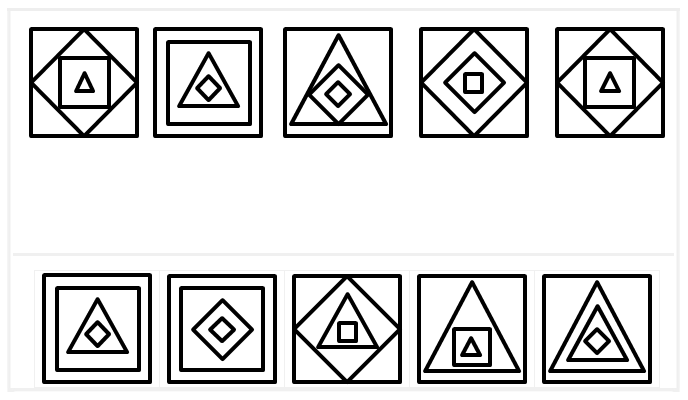 Thus, the outer shape in the missing frame should be a square (just like the middle shape in the 5th frame), the middle shape should be a triangle (like the inner shape in the 5th frame), and the inner shape should be a diamond (like the outer shape in the 4th frame). A = TV shows, B = boring, C = violent. According to the premises, (A + ~B)*most, and (A + C)most. The conclusion states (A + B + ~C)*at least one. In formal logic tests, most means at least most, which is more than half, but possibly more, and even all. This means you cannot conclude that even a single (A + B + ~C) exists, because all you know is that most of A is ~B and that most A is C.
It may be counter-intuitive, but if you are told that most TV shows are violent and not boring, that is the only thing you know. You know nothing about the items of the group not mentioned. Maybe all TV shows are violent. Are you looking for psychometric tests from a specific provider? We offer dozens of practice materials stylized after the most popular test providers used by employers including SHL, Kenexa, Cubiks and more. Gain access to our in-depth psychometric tests, study guides, video tutorials and more by signing up today. Regardless of if you are practising for an assessment designed by a certain test provider, or are looking for more general practise, we have got you covered. Our exclusive psychometric test PrepPacks™ include everything you will need to stimulate your learning process and boost your overall test performance. Sign up today to gain access to dozens of in-depth practice tests, study guides, and more. Numerical tests assess your ability to answer questions dealing with graphs, tables, number sequence, and word problems. The level of maths required to answer each question in this sort of test will depend on the position you have applied for. Verbal reasoning tests are used to evaluate your ability to draw conclusions and information from written text. During a verbal reasoning assessment, you will be asked to answer whether a statement following a passage can be verified by the information provided. You will be asked to answer by choosing ‘true’, ‘false’, or ‘cannot say’ for each statement. Abstract Reasoning: During this sort of reasoning test you will be asked to draw logical conclusions based on the information expressed through shapes, patterns and words. Inductive Reasoning: These tests often include a series of shapes or matrices. Your job will be to decide which image comes next in a series, or which one is missing altogether in order to complete the series. Deductive Reasoning: These tests are designed to examine your ability to apply a set of rules or premises that are known to be true onto a specific example. A language or literacy test is used to assess your understanding of grammar and your ability to spell. These tests are important for jobs that require a higher level of English. To see how we can help prepare you for your English skills test, click here. Technical-style are designed to gain insight into your numerical, visual, mechanical and/or spatial skills. These tests are administered for technically oriented job positions such as skilled and non-skilled technicians, mechanics, machine operators and more. For additional information on the best way to practise for your technical test, click here. During a spatial reasoning test, you will be assessed on your ability to mentally navigate 2D and 3D images. These tests evaluate your spatial visualisation, mental folding and mental rotation abilities, as well as your spatial and visuospatial function. Both mechanical and electrical aptitude tests assess your basic understanding of their concepts and terminology. Depending on your job level, the test you take may also require a higher level of analysis, including some amount of numerical calculations and an industry-specific context. These tests are used to assess you on your attention to detail and your ability to spot errors. Error-checking tests are used for several different industries, including marketing, education, hospitality, engineering, etc. For additional information regarding our error-checking practice materials, click here. These tests require you to be able to perform specific tasks quickly and accurately. Concentration tests are often given as part of the recruitment process for many roles including administrative and clerical, pilots, train drivers and other railway workers. Want to learn more about our concentration test materials? Click here. Practise makes perfect. This old saying still holds true. By taking your time to practise for your psychometric assessments, you will have no choice but to succeed. Relax – you’ve got this. If you have followed the previous step, you should have no trouble sitting your exam with a sense of calm. You’ve already become familiar with the material you will be tested on, so successfully completing your assessments should be a breeze. Manage your time. More often than not, your psychometric test will be timed. It is best to practise for your test beforehand to familiarise yourself with the test format and questions. That way, you will be able to answer each question quickly and accurately. Our practice tests give you the option to take a step-by-step, untimed test to get used to the test format and answering style. Once you have taken the step-by-step test you can race the clock in the timed version to see how far you have come.